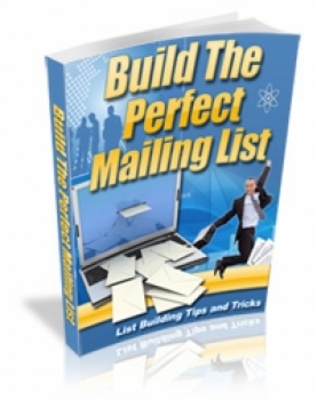 Practical Tips for Building A Mailing List : It can be difficult to build a permission based mailing list. With the overwhelming amount of traffic on the Internet, it is hard to know just how to develop a solid mailing list without resorting to purchasing one. There are several things you can do to build your list without buying one. Registration : First, make it easy for people to register their email address with you. Make sure that every page on your website has a link to your mailing list registration form. Feature it prominently on the first page of your website. The easier it is to register, the more likely people are to register with you. Fast Forward : Second, make use of the "forward to a friend" concept. By making it easy for users to invite their own friends, your visibility will grow. Use this to build your mailing list. Promotion : Fourth, promote your website to generate more traffic to your registration form. With more visitors to your website, you are likely to have more people register their email address with you. Use social networking sites such as Facebook and MySpace to advertise your website. Use blogs and comments, as promotional tools. Don.t forget to add your website to your email signature. Promotion is the key, so promote, promote, promote! Doing it by hand? Don't discount manually collecting email addresses. Business meetings, conventions, seminars, parties, anywhere that has a large group of people, are great places to promote your website and ask for email addresses.